The 10 Best Farmers Markets in Colorado! Colorado’s growing season might not be long, but it sure is abundant. The colorful state has a variety of local farmers, especially organic growers, that sell both fruits and vegetables during spring, summer and fall. 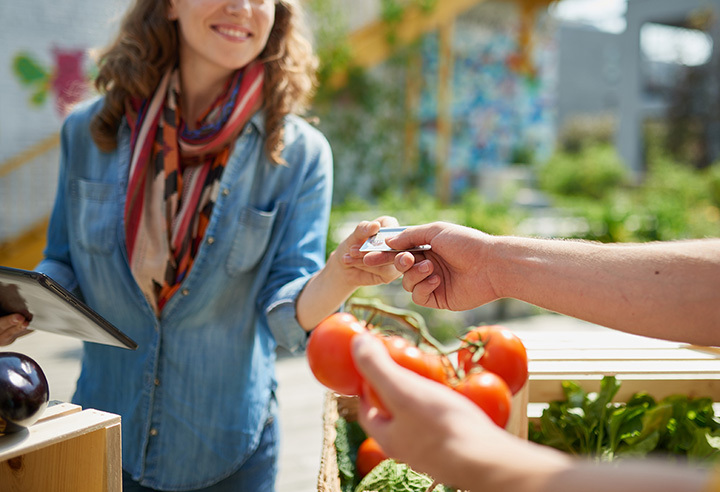 To get the freshest produce, a visit to a local farmers market is a must. Now when it comes to the Colorado markets on this list, all of them are operated during the spring, summer and fall, since Colorado growers can only grow during these seasons. No matter if you are looking for organic produce or handmade goods, the 10 best farmers markets in Colorado are sure to please. The Boulders Farmers Market, located in Boulder, is one of the most notable markets in Colorado. This market, which occurs on Wednesdays and Saturdays from April to November, has a variety of organic produce, free-range animal products and even handmade goods. Located in Denver, the Cherry Creek Fresh Market is Denver’s largest farmers market. The market occurs on both Saturdays and Wednesdays from May to September. Find artisan cheeses, chef demonstrations, live music and of course organic produce at this massive market. Every Sunday from June to October is the City Park Esplanade Fresh Market located in Denver. This farmers market takes place at Denver’s historic Sullivan Fountain. Enjoy organic produce from local growers and food vendors. This downtown event is a great spot to find some Colorado wines, cheeses and local flair. Enjoy local produce and gourmet products at a beautiful location in Golden. The Golden Farmers Market, which is at the Golden Public Library, caters to families and pets by having picnic tables and being near parks and trails. Make sure to check out the demos from master gardeners after you purchase some local organic produce. Support Colorado farmers at the Highlands Ranch Farmers Market in Denver. Not only will market-goers find local and organic produce but also handmade goods and gardening accessories. This farmers market takes place on Sundays from May to October. The Larimer County Farmers Market is the oldest farmers market in northern Colorado. Located in Fort Collins in the Larimer County Courthouse parking lot, this market features fresh and organic produce as well as artisan cheeses, kombucha, meat and eggs. If you are in search of freshly cut flowers and handmade goods, the Larimer County Farmers Market is a great place to shop too. Visit this farmers market on Saturdays from May to October. On Sundays from June to September is the Loveland Farmers Market. Located in the city of Loveland, this farmers market features over 40 different vendors, live music, food trucks and even food demonstrations. Adults and kids alike will enjoy the atmosphere at the Loveland Farmers Market, since the event does have face painting for the kids and craft beers for adults. Located in Denver, the South Pearl Street Farmers Market offers great prices for fresh fruits and veggies as well as an array for cheese, honeys, salsa, tamales and breads. Enjoy the vibe of this fresh farmers market every Sunday from May to November. If you are seeking gourmet and fresh food options outside of the grocery store, the Stapleton Fresh Market in Denver is the place to shop. Every Thursday evening from August to September and Sunday from June to October, this farmers market features local produce, meat, baked goods, food trucks and even freshly popped kettle corn. The Union Station Farmers Market is in Denver’s Union Station. Find locally-grown produce as well as popular Colorado artisans selling preserves, cheeses and dairy products. Even if you don’t end up buying anything from this farmers market, the historic venue of Union Station is a must-see location in the Mile High City. View more Colorado Farmers Markets.